Cancer is an extremely stressful time in the lives of everyone affected by it - not only the person in the hot seat but also their entire support network. And when the stress seems to go away after the cancer is gone, the side effect can linger around and fester into anxiety. It takes on a wide range of expressions in our lives that needs more attention and recognition. 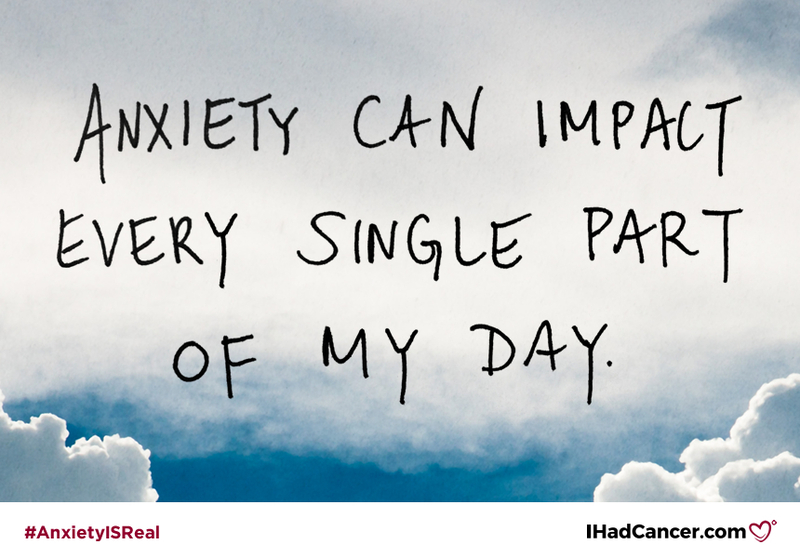 By sharing these images we hope to change the way everyone views the very real effect anxiety can have on anyone's life-- especially for those affected by cancer. 1. It is so, so hard to explain. I know that you want to understand what exactly I am going through but honestly, I have no idea how to explain it. 2. Sometimes I don't even know what makes me anxious. 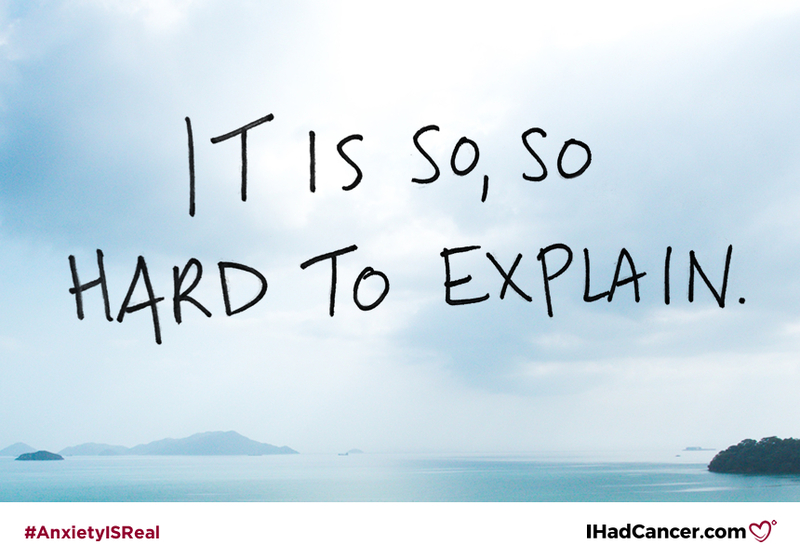 And part of what makes it so hard to explain is that it can come out of nowhere. I try and figure it out, but sometimes it just builds up in the background of my life and suddenly swoops down in one giant, debilitating cloud. I’m pretty sure that cancer is the root of it, but I can’t always put a finger on it. 3. Anxiety can impact every single part of my day. What I do want you to know is that it's something that rides on my back from the moment I wake up until I go back to bed that night. It can even slip into my dreams. Not to mention when I have a scan coming up...the scanxiety is 24/7. 4. 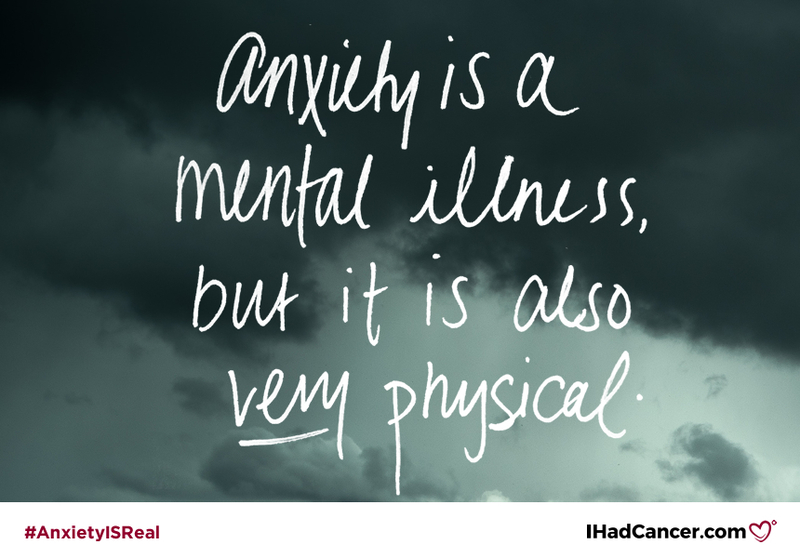 Anxiety is a mental illness, but it is also very physical. A lot of people think that anxiety is just mental. But there are so many physical side effects, especially to an anxiety attack- pounding heart, sweating, headaches, dizziness, upset stomach, just to name a few. Add those onto the side effects I’m already experiencing from treatment, and you’ve got yourself a tough combination. 5. 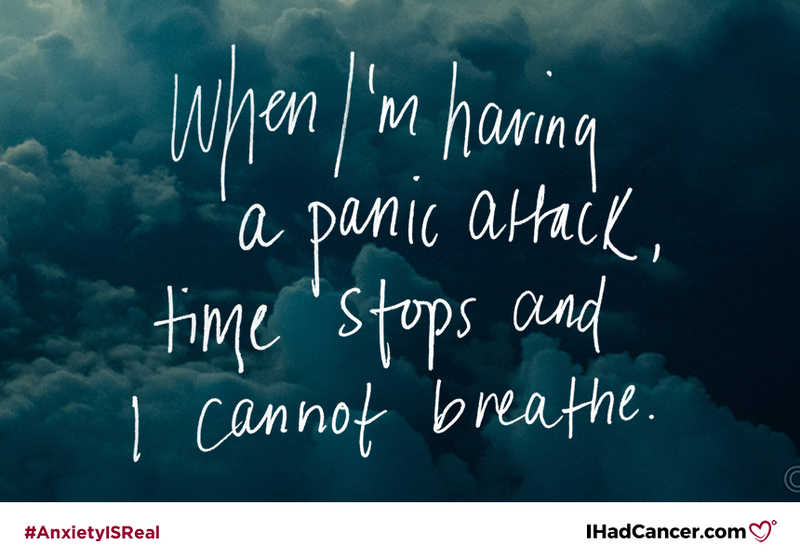 When I'm having a panic attack, time stops and I can't breathe. My body simply does not respond. It's terrifying. I can't communicate what's wrong to the people for whom time has most definitely not stopped. 6. 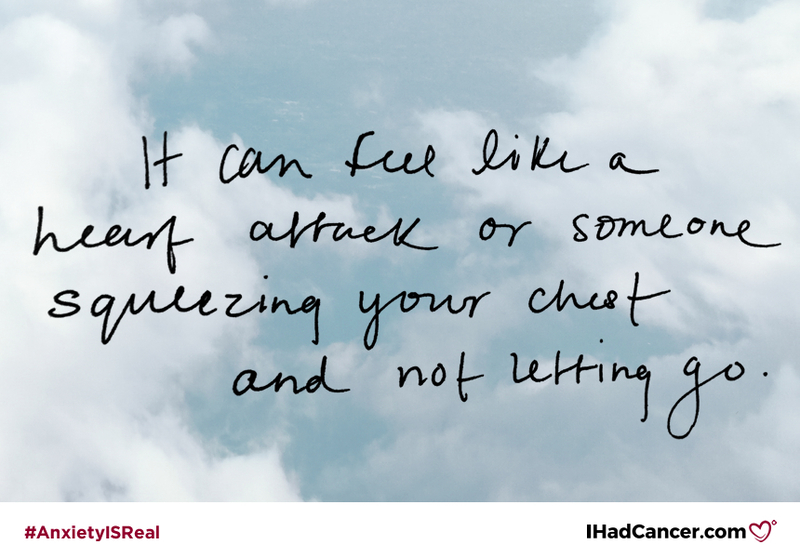 It can feel like a heart attack or someone squeezing your chest and not letting go. The closest thing I’ve heard it compared to is a heart attack. Imagine a weight pressing down on your chest that keeps lowering inch by inch while the outside world just sees someone walking to the train. and I’m trapped in the pitch dark-- underground, with no windows or doors. 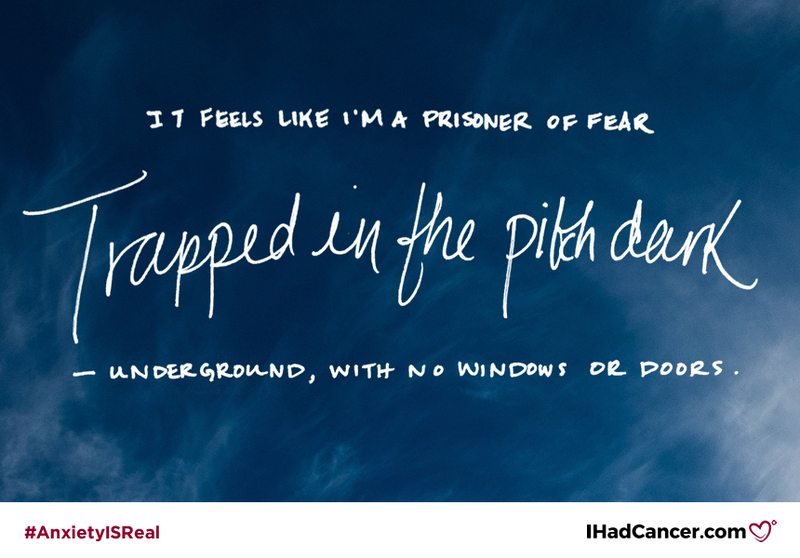 As hard as I try, I cannot stop myself from thinking about my fears - especially of recurrence. Ugh, cancer, please do not return. 8. Anxiety doesn't always look the same on everyone. I know that you try and spot the signs, but it’s important to know that not everyone shows their anxiety in the same way. Some are scared and depressed, others are angry and lonely, and still others are worried and nervous...There isn't just one face to anxiety. 9. 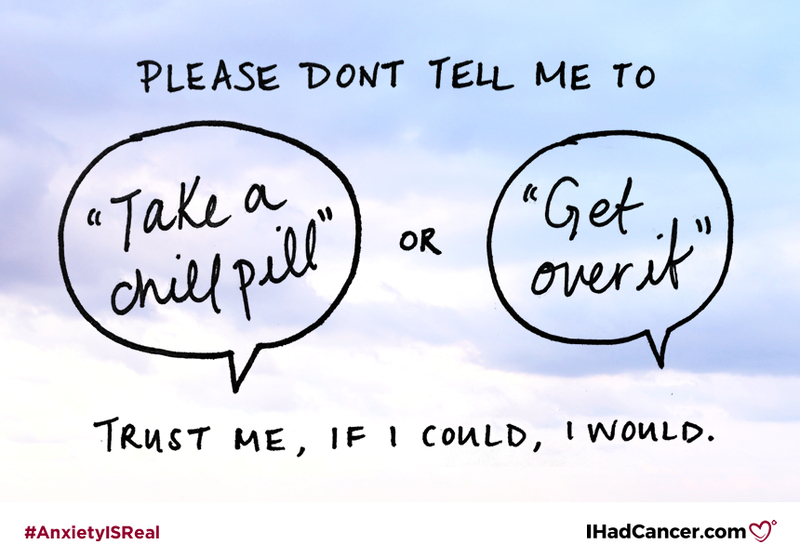 Please don't tell me to "Take a chill pill" or "Get over it." Trust me, if I could, I would. And yes, I try - I really do try. 10. 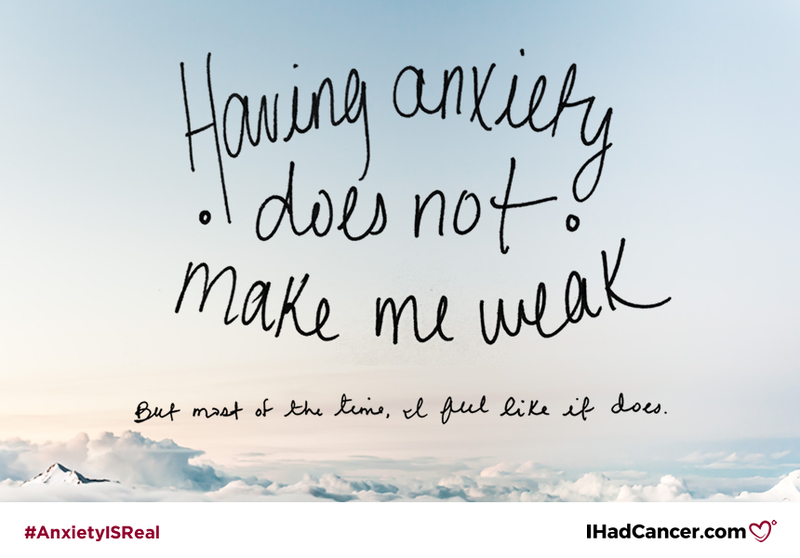 Having anxiety does not make me weak. But most of the time, I feel like it does. It's hard to keep a positive attitude when I feel like I’m barely keeping my head above the water. So please, sit with me and tell me it's okay. Tell me I’m not weak. Tell me I'm not crazy. Make me believe it. Help me break down my fears into actionable steps and let me take those steps at my pace. 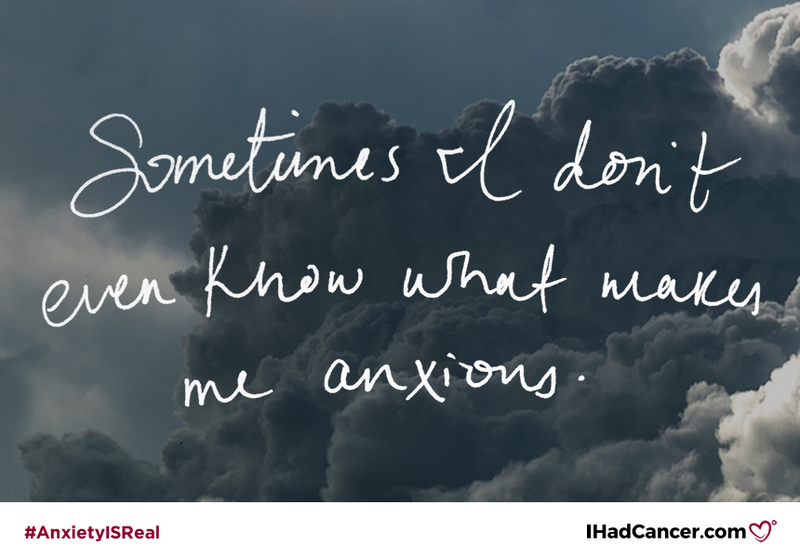 Ask me what else I want you to know about anxiety; it will help me just to know that you want to understand. And if/when the day comes when you experience it, please remember that I am here to talk about it. 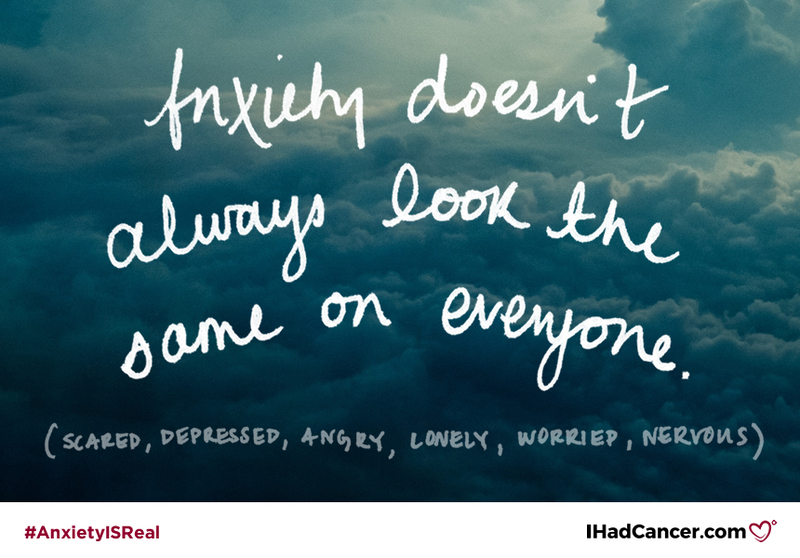 You are NOT alone - not in cancer, not in anxiety, not in anything. What shape does your anxiety take? Share in the comments below or sign up here.